On arrival in Srinagar drive direct to Baltal via Sonamarg. The distance of about 115 kms will be covered in about 3-½ hrs. Rest of the day free at Baltal for acclimatization and prepare for next day's trek to Amarnath Cave. Dinner overnight in tents at Baltal. After very early breakfast trek upwards to Amarnath cave for darshan. The route is ascending right upto the cave. 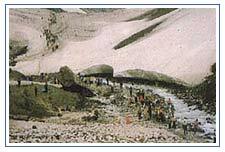 Have a dip in the ice water of Amarnath stream, which floes outside the cave. Inside the cave there is scenery of calm tranquility of white and glistering three massive Lingmas stand erect symbol of Lord Shiva, Parvathi and Ganesh. After darshan return back to Baltal. Approx. 25 kms (leave morning at 0530 and arrive back at 1930 hrs). Dinner overnight in tents. Morning sightseeing of Mughal Gardens visiting Nishat Bagh (Abode of pleasure) built by Asif Khan brother in law of Jehangir in 1632 AD. And Shalimar Bagh (Abode of love) built by Jehangir for his wife Empress Noor Jehan. All the gardens are situated on the bank of Dal Lake with the Zabarwan Mountains in the background. The distance from Srinagar to the said gardens is about 12 and 15 kms respectively. Enroute visit carpet-weaving factory. After lunch Shikara ride on Dal Lake visiting floating and vegetable gardens etc. Also witness walnut woodcarving and papier machie making demonstration. Dinner overnight in Deluxe Houseboats. Free for shopping and individual activities. Dinner overnight Deluxe Houseboats.